SignCraft, established in 1985 was always a well known quality sign company owned and operated by Tom and Pat Crane. In 2011 Tom and Pat made the decision to sell the business to Dymond Design, previously located in Barrie Ontario for twenty years. 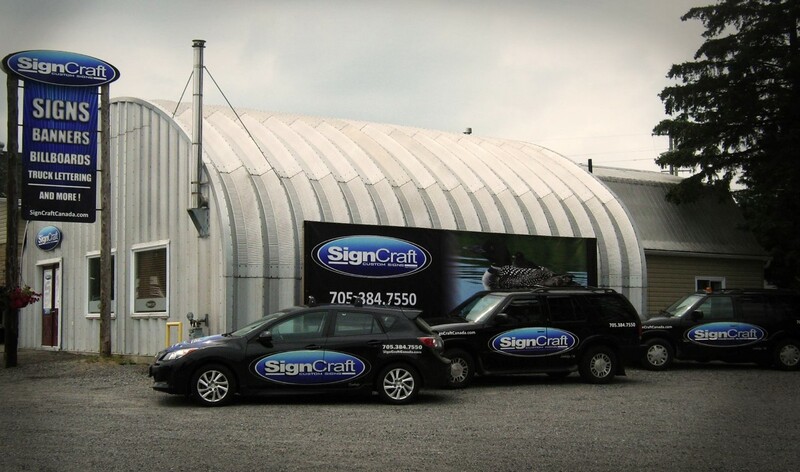 At this time SignCraft was rebranded and strategically relocated into the heart of Sundridge to better serve customers. Since then SignCraft has expanded and worked hard to cater to the needs of local businesses and entrepreneurs and has grown to be an asset to the community. Based on hard work, creativeness and dedication, our full-time talented staff works one-on-one with you to find creative solutions. By using the industries latest techniques, we guarantee to complete your project to your up-most satisfaction, as well as on time and on budget. SignCraft has completed a mass variety of signage within the area and we promise our expertise is second to none. Having produced signage for local businesses, large organizations and corporate identities, we guarantee that we can handle any project with great proficiency and professionalism. We take tremendous pride in the quality of work we produce. We understand that the signage we provide not only reflects your businesses image, but more importantly your success. By being located in Sundridge Ontario, we strive to be a centeral hub for North Bay, Parry Sound and Hunsville Ontario. As well we serve small communities such as South River, Powassan, Trout Creek, Burks Falls, Kearney, Magnetewan and more. To serve our clients best, we provide a variety of services to ensure quality products and upmost satisfaction. With our creative designers, experienced producers and the trade’s best installers, we execute our projects from concept to completion. SignCraft Custom Signs, Serving North Bay Ontario, Parry Sound Ontario, Huntsville Ontario and everywhere in between.